As usual the best part comes last. 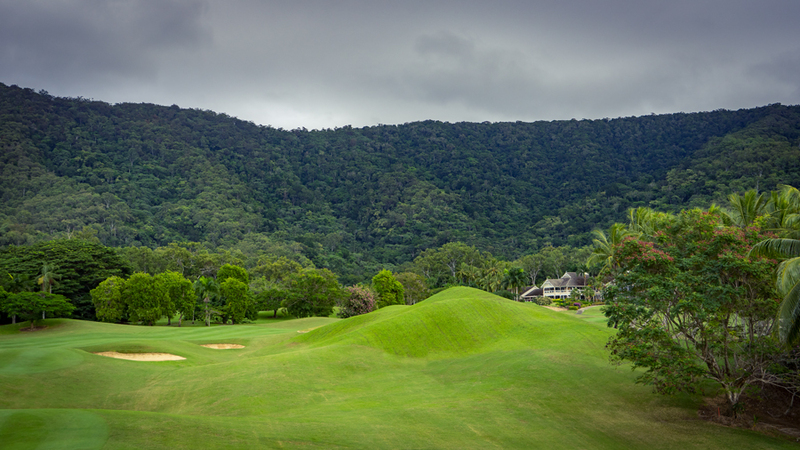 After five exciting days in Port Douglas we decided to travel down to Brisbane. But don’t leave the area without playing Paradise Palms. 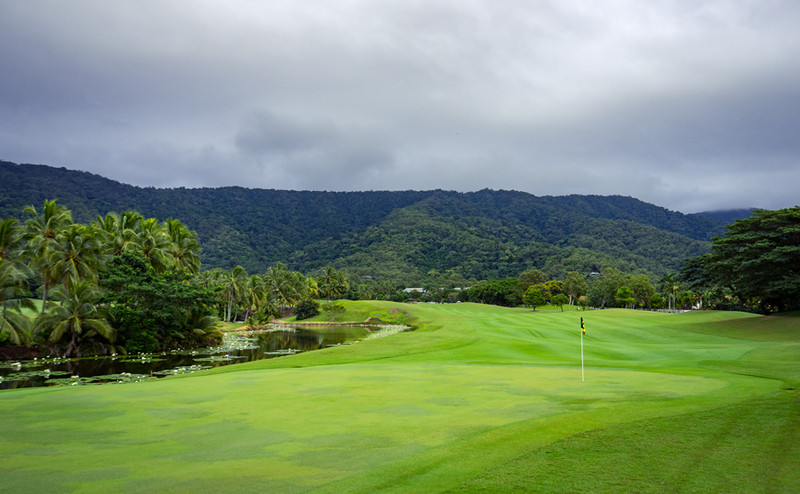 We decided to stay at the Resort of the golf course which is also called Paradise Palms Resort. 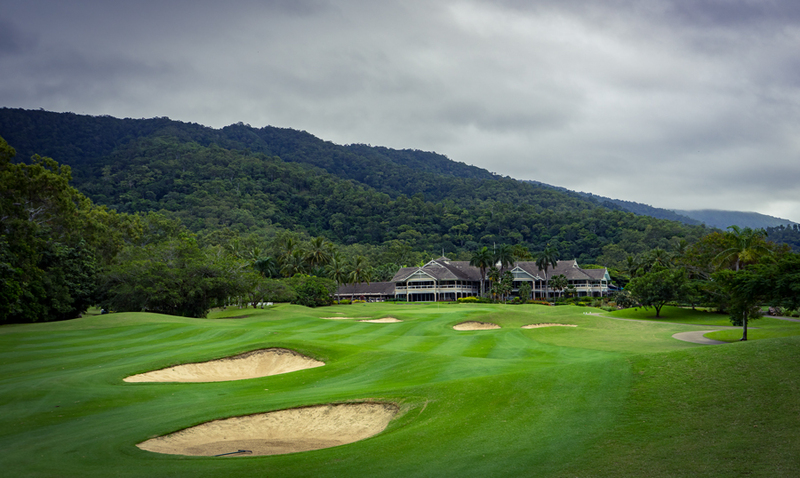 The clubhouse and the Resort are almost one building so you can just walk over to the clubhouse sit on the terrace which is granting close views of the greens of hole numbers 9 and 18 and enjoy a delicious breakfast. I highly recommend the squashed avocado toast with poached eggs. Paradise Palms also offers an awesome mini golf course next to the pools. So you can park your family and enjoy your round. 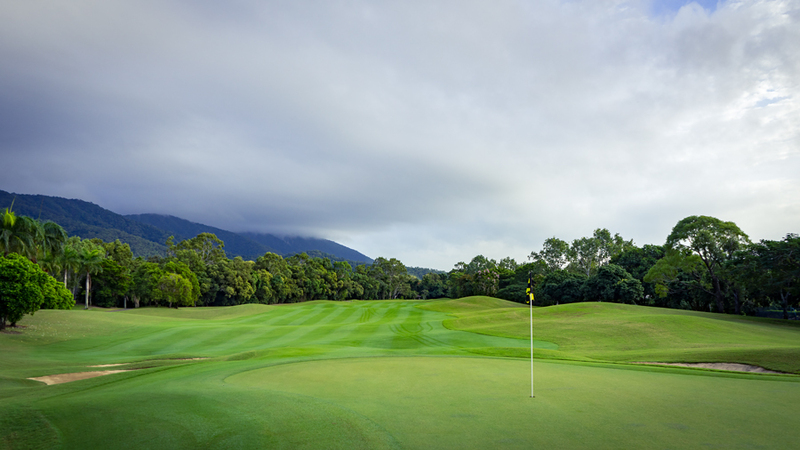 The championship golf course has multiple tee options for all levels of golfers. As so often I took the first tee time of the day and decided to play from the championship tees again. A pretty hard decision but true to the game. Without any practice swings I arrived on the first tee and tried my best. The first hole got me but the real beauty of the course starts at No. 2. 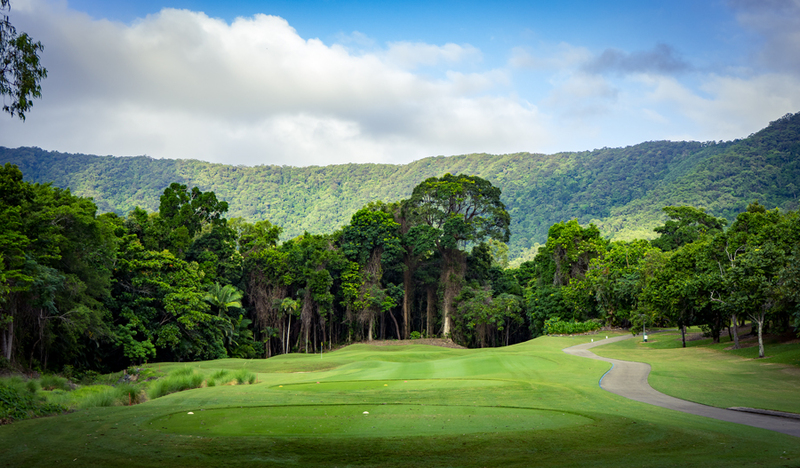 With an elevated tee box and a narrow driving lane throughout the rainforest. 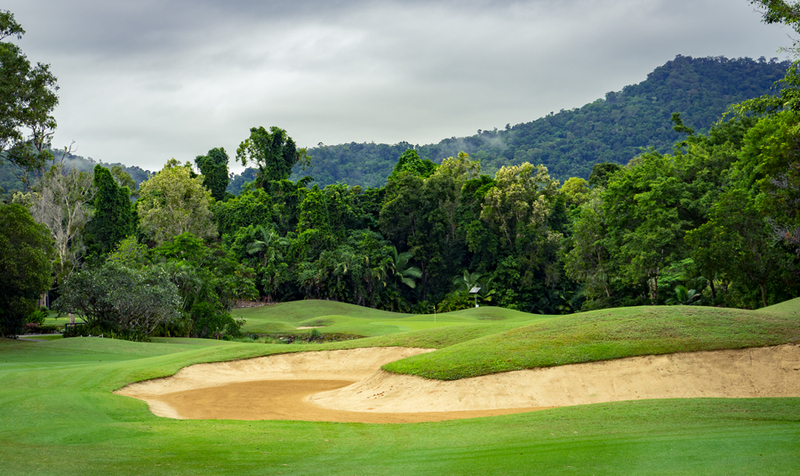 So try to hit your ball straight and aim the left side of the fairway because there are two huge and deep bunkers on the right. Once you made it, you have to trust in your second shot! Before the green there is a big creek crossing the fairway and the green itself is an evil beast. Walking to the next hole with par on your scorecard is a great result. 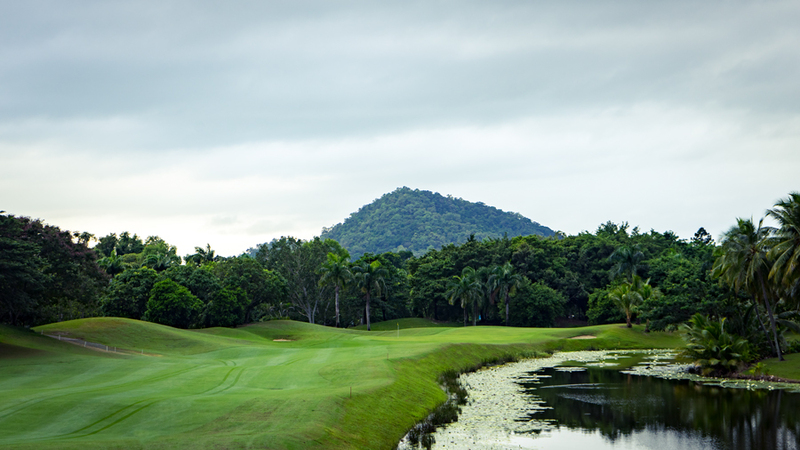 Throughout the next holes you will discover the beautiful but tough course design. No. 6 and 7 are again some true tester. No. 6 is a nasty par 4. The creek from No. 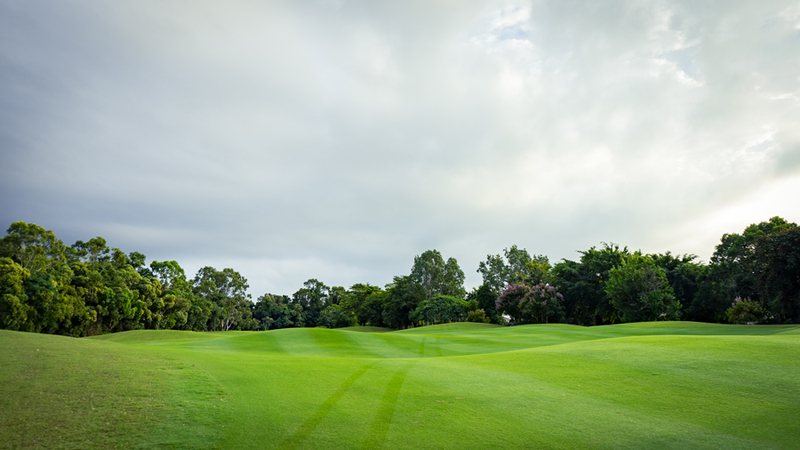 2 is crossing the fairway again namely straight in the landing zone of every wood you hit. 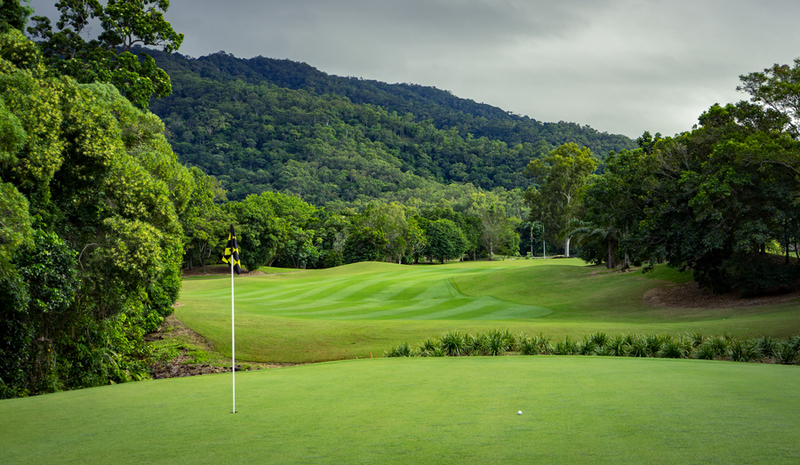 Even if you hit it short, on the hard and bouncy fairways your ball probably will bounce into the creek. I tried to play it save and hit a 5 iron from the tee and decided to attack with a long second shot. The idea just worked partly because my second shot ended up right in front of the green. I pitched it on the green but I screwed it up with a terrible 3 putt for a double. 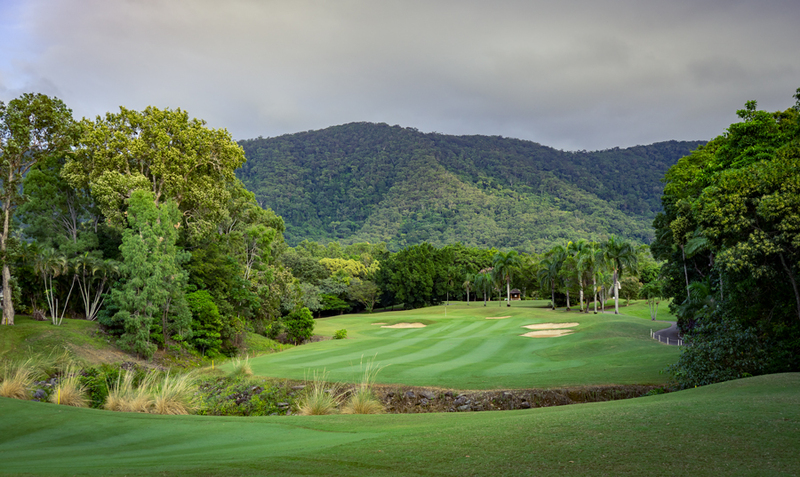 The greens have been perfect and extremely fast because Paradise Palms is just preparing the whole course for the „Cairns Classic“ an PGA ProAm event which takes place in mid-June. 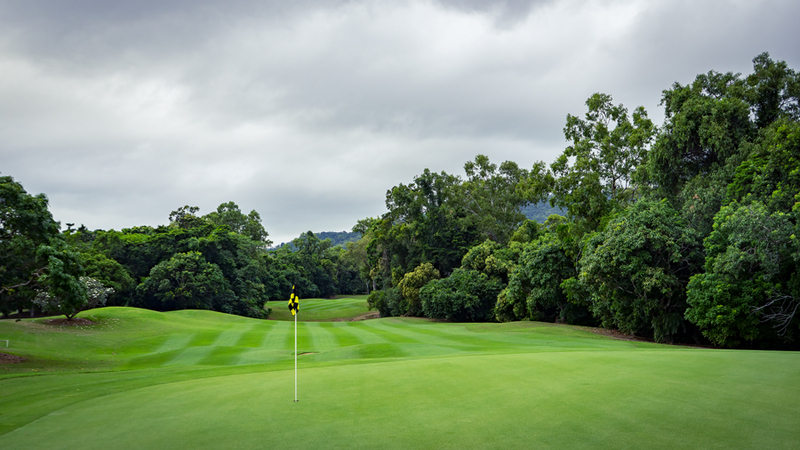 I totally loved to play this course but the most fun was putting on the perfect greens. No. 7 was a bizarre par 3. 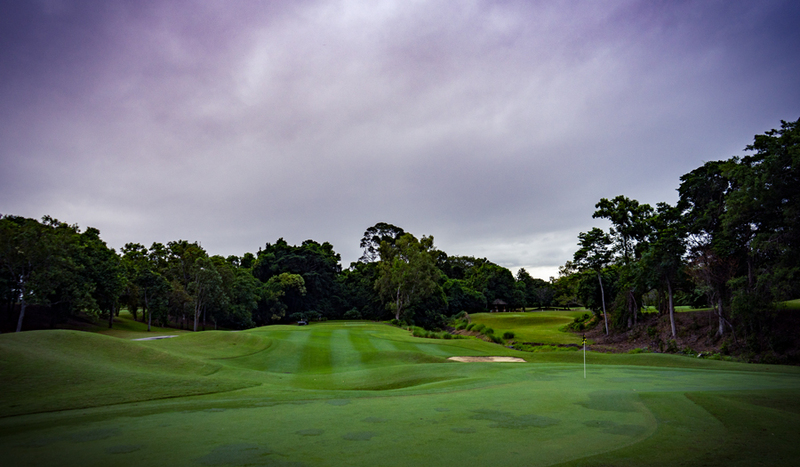 Mid-length from the champion tees with 152m, the green itself was very long and narrow and on both sides protected by bunkers. I hit a good one, well to good and ended up at the back edge of the green in the fringe. Using the putter would have been stupid, the only chance was a flop shot. I was very proud to finish this beauty with par. In sum the front nine of Paradise Palms are world class golf and I was really eager about the back nine. I quickly discovered the difference after playing No. 10 to No. 14. My drives ended up more often in the very thick rainforest. 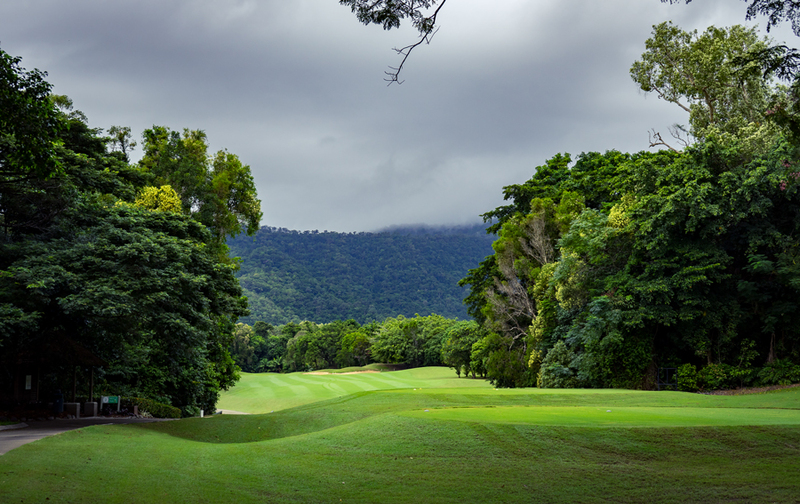 Basically all holes of the back nine wind through the tropical rainforest. So more chance for me to discover the exotic wildlife on the course. 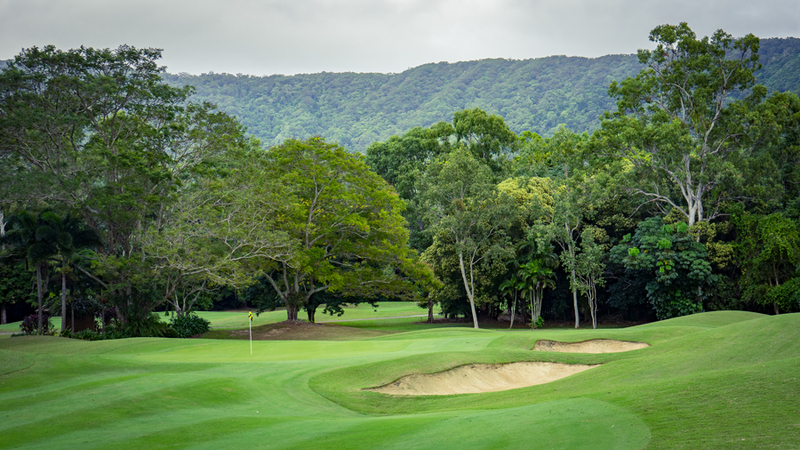 Birds, lizards and the very lovely wallabies which are crossing from time to time the fairways. I really feel in love with them. On the hole numbers 16 and 17 the, well, let´s name it “nice creek” is crossing the fairways again. Hit and hope or play it save and risk a bogey. But it all comes to an end at the 18th hole. 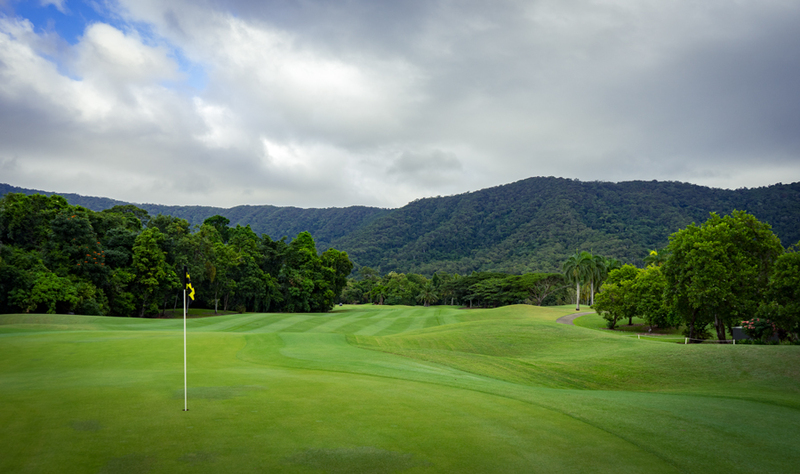 A finishing masterpiece golf hole. 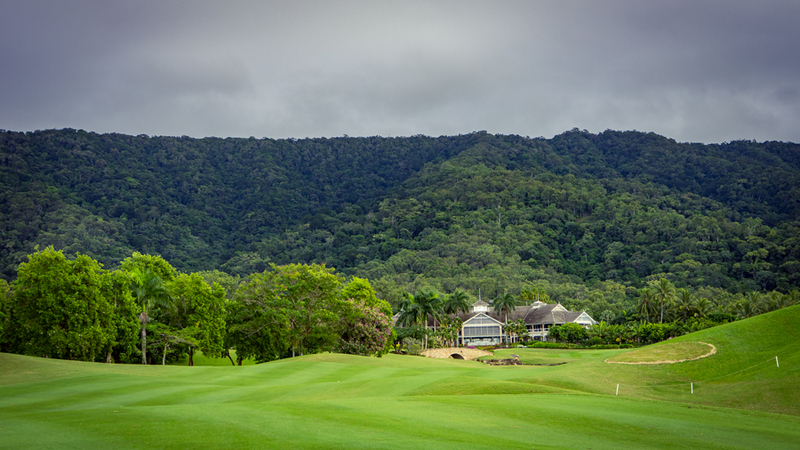 You can see the Queensland style clubhouse already from the tee, well placed straight into the rainforest. With 383m from the champions tee again a real tester. Of course my shot wasn´t long enough to end up in the fairway bunkers but split the fairway and left myself again with a long second shot. The second shot need to be more accurate to avoid the two bunkers on either side of the green. Luckily I also avoid them. With a good pitch I made it close to the flag stick but from here I still needed two putts on this amazing greens. The result was a well played bogey. It was such a pleasure to play such a great course in this amazing conditions and in summary I played my best round of this year. Earlier this year I had the chance to play Tiburon GC in Naples during my visit at the PGA show 2017 which is also operated by Troon Golf. 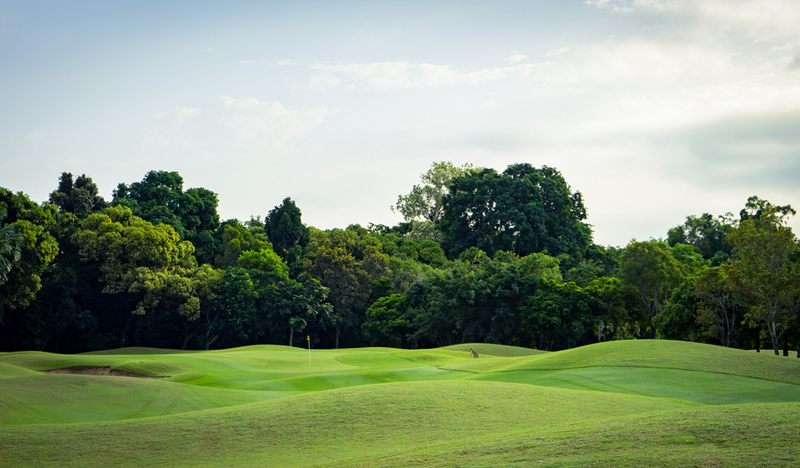 They really know how to manage golf courses as well as facilities and service. 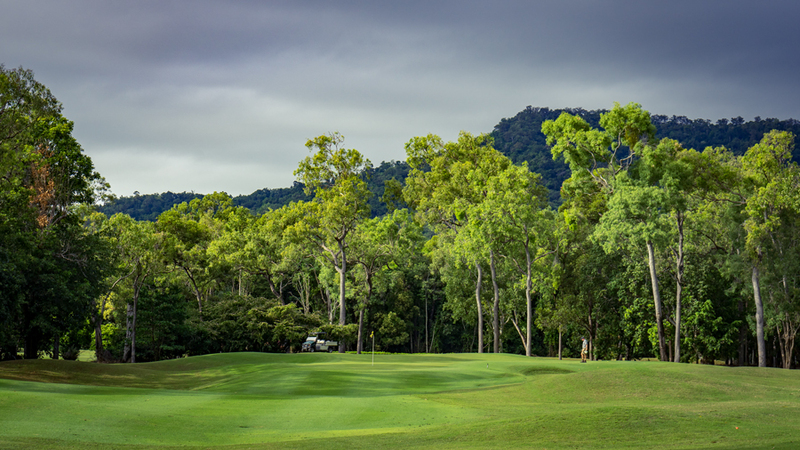 Ultra modern GPS golf carts, extremely well maintained golf courses, super friendly stuff and culinary delights define the golf-indulgence of Troon. 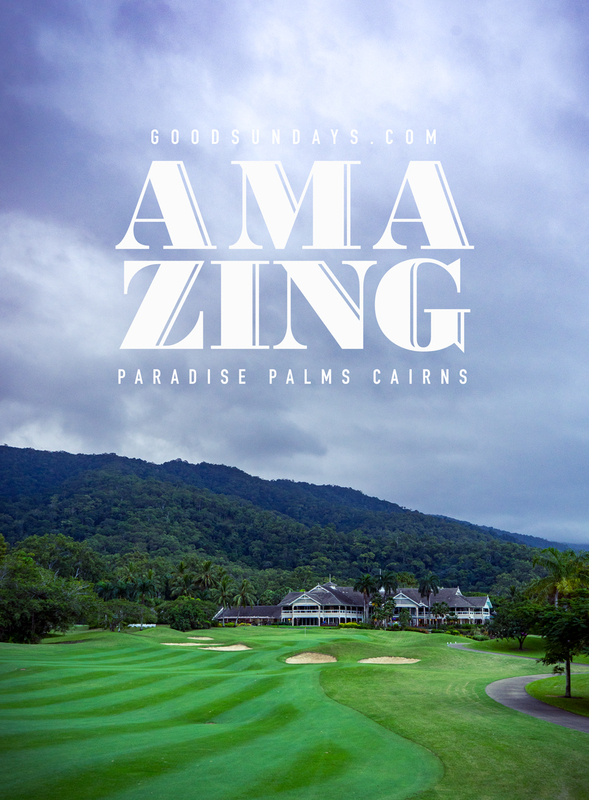 So if you are ever around Cairns, take your time and play Paradise Palms. It´s an absolute must!